We know that unmet health needs can interfere with learning. But when health and education come together, great things happen. Attendance improves. Conditions such as asthma and diabetes are better managed. And behavioral health issues get quick, expert attention. The practice of providing critically needed services such as medical, behavioral, dental and vision care directly in schools has been gaining traction throughout the country for years. There’s strong evidence that a school-based health center (SBHC) can help level the playing field and improve both health and academic outcomes for all students in a given school. 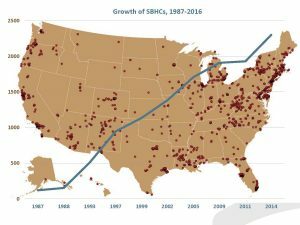 While there are fewer than 10 SBHCs in Alabama, there are currently more than 2,500 in 48 states nationwide. The only school-based health center operating in Central Alabama is at Oakman Middle School (K-8) in Walker County. As part of the Bold Goals Coalition’s work to improve health in Central Alabama, the Walker County Health Action Partnership collaborates with Walker County Schools and Whatley Health Services to support the Oakman Student Health & Wellness Center at Oakman Middle School. Launched in October of 2016, this school-based health center is an innovative way to provide immediate access to affordable, high-quality healthcare in the place where students spend most of their day – in school. The medical partner Whatley Health Services is a federally qualified health center that has served Walker County since 2001. Onsite services include the proactive delivery of preventive primary and behavioral healthcare to ensure the wellness of all students. In the spring of 2018, Walker County Schools received an Advancement Fund grant from United Way of Central Alabama to work with the School-Based Health Alliance, a leading national organization that supports a growing network of SBHCs across the country. Through this alignment, the Oakman Student Health & Wellness Center has access to supportive resources and research on best practices. Now in its third year of operation, the Oakman center serves students five days a week with access to a pediatrician, a certified registered nurse practitioner, a licensed independent clinical social worker and a behavioral health care coordinator. The Bold Goals Coalition will continue to support the Oakman Student Health & Wellness Center as it provides these valuable services in a rural area. The Oakman center is a unique site in Central Alabama, and the Bold Goals Coalition is working to expand availability and make school-based health centers a common practice throughout the region. To learn more about school-based health center efforts in Central Alabama, please contact Kadie Peters, Vice President of Community Impact for Health at United Way of Central Alabama: kpeters@uwca.org.